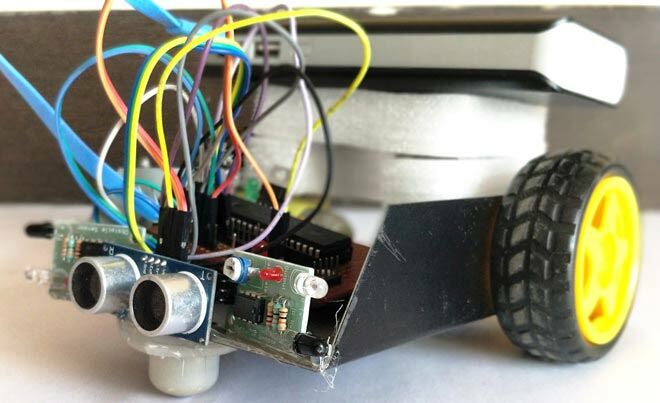 Obstacle Avoider Robot is another famous robot which spices up embedded projects. For those who are new Obstacle avoider robot, it is just a normal wheeled robot which could navigate its way without hitting on any obstacles. There are many way to build a Obstacle avoider robot in project we are going to use one Ultrasonic Sensor (front) and two IR sensor (Left/Right) so that our robot has eyes in all three directions. This way you can make it much smarter and faster by detecting objects in all three sides and manoeuvre accordingly. Here we are suing PIC Microcontroller PIC16F877A for this obstacle avoiding robot. The operation of an obstacle avoiding robot can be observed from a real time product called Home cleaning robots. Though the technology and sensors used in these are much complicated, the concept remains the same. Let us see how much we can accomplish using our normal sensors and PIC microcontrollers. The concept of Obstacle Avoiding Robot is very simple. We use sensors to detect the presence of objects around the robot and use this data to not collide the robot over those objects. To detect an Object we can use any use sensors like IR sensor and Ultrasonic sensor. 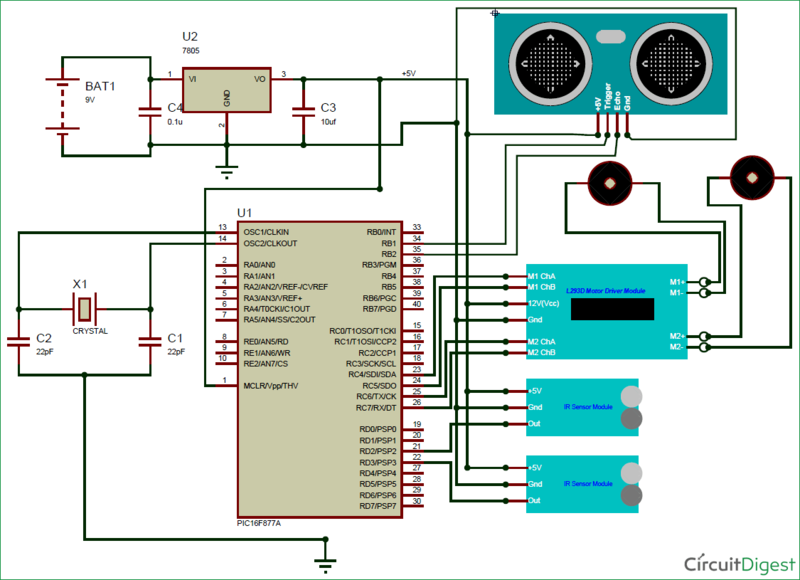 A motor Driver module like L293D is mandatory because the amount of current required for running the DC gear motor cannot be sourced by the I/O pin of the PIC microcontroller. The sensors and the module is powered by the +5V supply which is being regulated by the 7805.